You'll be £25.00 closer to your next £10.00 credit when you purchase Verdun 1916. What's this? Wrapped in myth and distortion, the Battle of Verdun is one of the most enigmatic battles of the Great War, and the controversy continues a century later. Before the battle the Germans believed they had selected one of the strongest points in the French defences in the hope that, if they smashed through it, the French would collapse. But Verdun was actually a hollow shell since its forts were largely disarmed and the trench lines were incomplete. So why did the Germans fail to take Verdun?rnAs well as seeking to answer this fundamental question, the authors of this perceptive new study reconsider other key aspects of the battle – the German deployment of stormtroopers, the use of artillery and aircraft, how the French developed the idea of methodical battle which came to dominate their military thought after the war. They look too at how Verdun brought about a renaissance of fortress engineering that resulted in the creation of the Maginot Line and the other fortifications constructed in Europe before the Second World War. This is a fascinating and detailed study of essential interest to the keen student of fortification. This is one of my favorite books on World War I since it ties everything together from 1914 until the great battle in 1916 and even includes information on the Eastern Front. Everything is spelled out in the most understandable way which makes this a wonderful selection for the coverage of the battle. The illustrations are numerous and for the most part well done although one of the best maps is the only one in color and is on the back cover. If you only get one book on World War I, this is the one I would recommend. The price is a bit high, but the book is well worth it. 5 stars - Small book, big content. Really excellent book. It seems a small tome but is full of info, from maps and photos, to side articles regarding different aspects and characters of the battle and the Great War in general. In those stories, a French soldier called Blue tells the story of the Battle of Verdun, with an excellent script from Pat Mills (who memorably refers to the Battle of Verdun at one point as ‘France’s Alamo’) and beautifully illustrated by Joe Colquhon, one of the all time great artists in any field. So, I particularly enjoyed learning more about the Battle of Verdun, and in this value-for-money book, there is most certainly a lot to learn. It was, and is, one of the most controversial battles of the Great War. Prior to the battle, the Germans assumed that they had picked one of the strongest sections of the French defences to attack, and that if they broke though there, the French army would collapse. But the reality was that most of the forts at Verdun were disarmed and the trench lines were in complete. But the German army were not able to take Verdun. The Kaufmann’s thoroughly researched book thoroughly researched book attempts to explain why. The Kaufmann’s consider all aspects of the battle, the employment of relatively new technology like aircraft, the use of artillery, and most important of all, the effect the battle would have on future French military planning, for instance their faith in the Maginot Line. The book is superbly presented and illustrated, with many fine diagrams and maps, absolutely essential for such a detailed study. 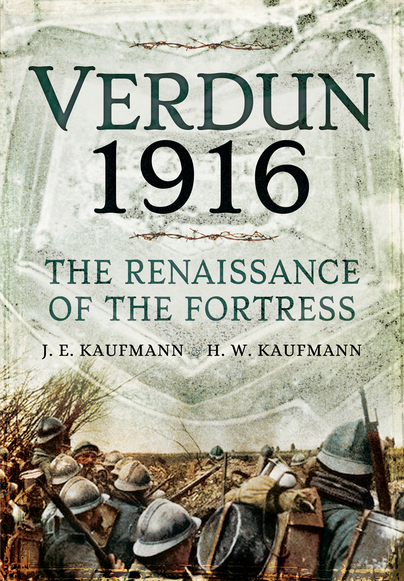 Superbly written, and just the right time to publish it, for the Battle of Verdun’s centenary year. J.E. Kaufmann is a retired teacher and presently an adjunct professor at Palo Alto Jr. College and H.W. Kaufmann, PhD, is a retired professor, and they live in the United States. Their most recent books on fortifications are The Maginot Line, The Atlantic Wall, The Forts and Fortifications of Europe 1815-1945: The Central States and The Forts and Fortifications of Europe 1815-1945: The Neutral States.